According to medical records reviewed exclusively by CBS News, a U.S. doctor who evaluated American and Canadian diplomats working in Havana diagnosed them with conditions as serious as mild traumatic brain injury, and with likely damage to the central nervous system. The diplomats complained about symptoms ranging from hearing loss and nausea to headaches and balance disorders after the State Department said "incidents" began affecting them beginning in late 2016. A source familiar with these incidents says officials are investigating whether the diplomats were targets of a type of sonic attack directed at their homes, which were provided by the Cuban government. The source says reports of more attacks affecting U.S. embassy workers on the island continue. The doctor, one of several who reviewed their cases, included a warning in the medical records about the health risks of future exposures. The diplomats underwent comprehensive audiological evaluations and a battery of other tests. In a statement received by CBS News from the University of Miami Health System, they confirmed its physicians were "consulted" by State on its diplomats in Cuba. "Like any top-notch academic medical center in the nation, the University of Miami is often consulted regarding complex health care issues or emerging diseases. In the case of U.S. diplomats, our physicians were consulted by the State Department," read the statement from the university. "The expertise of our physicians and researchers across a variety of fields naturally positions us to assist in these matters, and we consider it our obligation and responsibility to share that knowledge as needed. Regardless of the circumstances of providing medical care, maintaining patient privacy stands as a top priority for the University." An American doctor also visited Havana in the spring to assess U.S. embassy workers, according to the source. A number of diplomats have cut short their assignments in Cuba because of the attacks. The source says American diplomats have also been subjected other types of harassment including vehicle vandalization, constant surveillance, and home break-ins. Although the State Department says it hasn't identified a definitive source of the attacks, it has reminded Cuban authorities of their international obligations to protect diplomats. The U.S. also expelled two Cuban embassy officials in Washington May 23. "We hold the Cuban authorities responsible for finding out who is carrying out these health attacks on not just our diplomats but, as you've seen now, there are other cases with other diplomats involved," Secretary of State Rex Tillerson told reporters earlier this month. Cuba has denied any involvement in the attacks. "We remain in regular contact with the Cuban government to emphasize that we take these incidents very seriously and to resolve this matter in a satisfactory manner," a State Department spokesperson for Western Hemisphere Affairs tells CBS News. 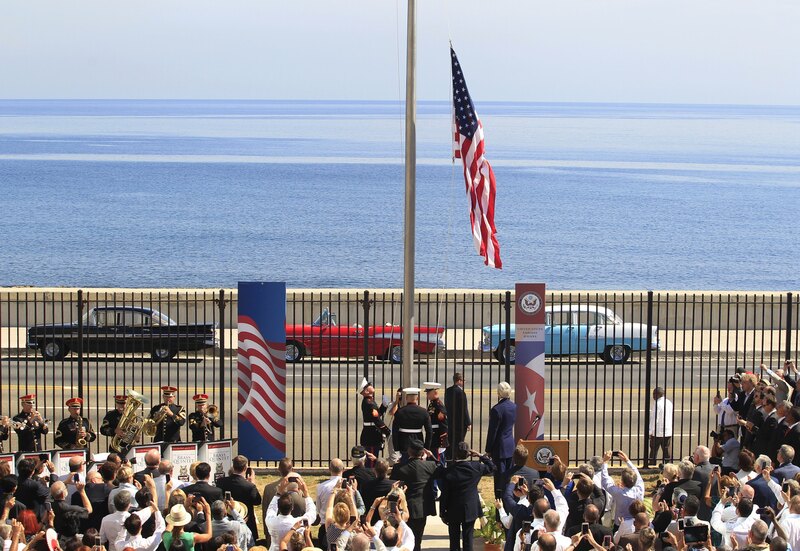 But as the U.S. pledges publicly to hold Cuba accountable for the protection of its diplomats, there are signs the U.S. may be privately moving forward with plans to make it easier for Americans to visit and do business with the country. On Tuesday, the Treasury Department's Office of Foreign Assets Control removed hundreds of internet domain names primarily focused on travel to Cuba from its Specially Designated Nationals and Blocked Persons list. The people, groups and entities on this list are restricted from doing business in the U.S.
"While there may be a legal basis for the removal of the domain names from the SDN/BP list, to remove so many at one moment has optical significance," says John Kavulich, president of the New York-based U.S.-Cuba Trade and Economic Council. It "is demonstrative of the distance between political rhetoric and practical implementation of policy." But a Treasury Department official explained to CBS News that OFAC's removal of the domain names may be misconstrued as more significant than it actually is. A single company was delisted Tuesday, and that company had 60 websites with "countless domain names," the official said. Delisting that one company meant including all of the websites and domains associated with the company.